Langley Park is a real funky place in an interesting way. Where else in the DMV (DC, MD, VA – not the dreaded lines to pay your traffic tickets) can you find a slew of different cuisines within a stone throw of this Maryland suburb – Vietnamese, Pakistani, Chinese, Caribbean, Latin American, African, and countless more. Since it is located just down the road from my university halls, I used to haul myself down the road for these tasty bites and also head to the different markets that cater to the ethnic population in that area. Without amiss, there is a slew of Indian eateries and markets dotting that same strip which I have paid my many visits, especially to one of my favorites. Tiffin is located just off the amazingly busy University Boulevard that never ceases to slow down even on the weekday. It is sandwiched by other Indian stores that are hawking off either cheap saris or the latest Bollywood DVD. Not too long ago, Udupi, an Indian vegetarian restaurant, merged with this meat-serving eatery. 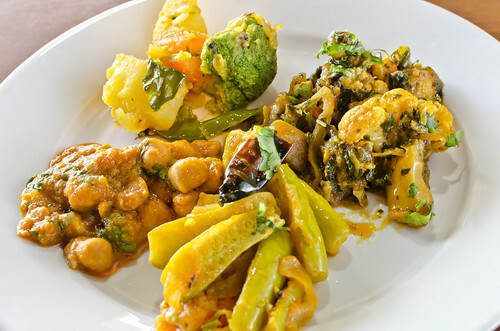 But Tiffin still serves the same vegetarian buffet with the adddition of a few meat selections at the end of the line. What better day than a cool dreary one for me to step in and taste some Indian food. My favorite starters are the soups that greet you first. Without doubt, Samber is what I look forward to to ingratiate my tongue with. 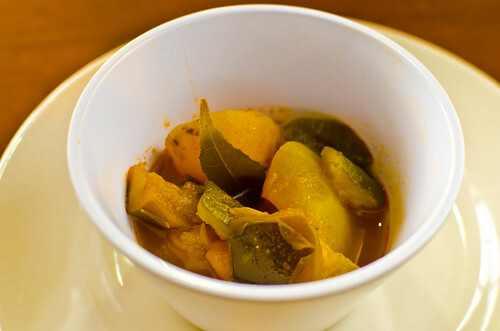 It is a complex concoction of lentils, zucchini, pumpkin, red radish, red chili, long squash, “vegetable drumstick”, curry leaves, bay leaves, mustard seeds, and tamarind pulp that brings the sour element to this light yet flavor-packed vegetable broth. 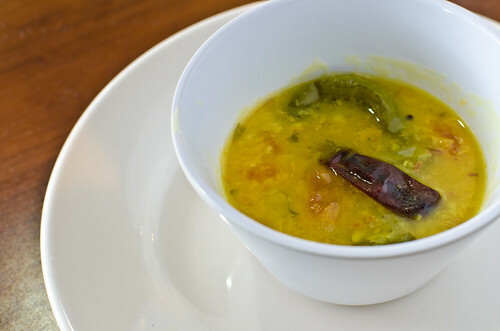 A Yellow Dahl Soup maybe less complicated than the above but it is not short in flavor and spiciness from both dried red and fresh green chilies, especially the whole cumin seeds that explode in the mouth with their pungent fragrance. An array of small bites made some decent appetizers on that day. Alu Bonda is basically Fried Potato Balls and Medhu Vada are, as the waiter put it, Lentil Donuts. They are lightly spiced with either some cumin or curry leaves, but they are rather tame in comparison to the other highly spiced offerings. What elevate them beyond the level of starch are the side sauces of one consisting of cilantro and the other sweat and sour made with tamarind. 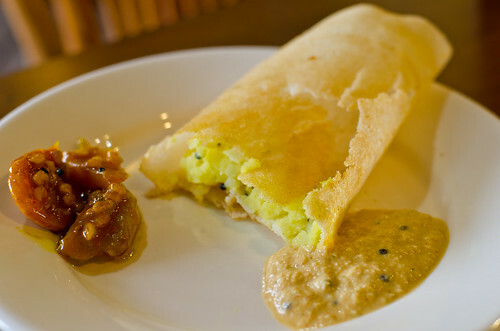 Masala Dosai is a crispy fermented rice pancake stuffed with a potato curry onion mix that is contrasted and complemented by a cooling, slightly sweet and sour, and rich nutty Coconut Chutney that immediately transports you to South Asia with this tasty bite. For the vegetarian mains, there is a wide variety and here we see the kitchen’s cooking strength. This day’s offering were Mixed Vegetables that consisted of cauliflower, corn, spinach, daikon; an Aloo dish made from broccoli, mushroom, potato, carrots, and spiced with cumin, and curry leaves; the omnipresent Chana Masala which are chickpeas cooked in a tomato sauce and various spices; and an exotic Tendli Masala which had the interesting small cucumber-like vegetable cooked with onion and tomato spiced with cumin, mustard seeds and bay leaves. These offerings were very satisfying due to the skilful manner and the variety in the kitchen’s handling in the spice department. Such wonderful vegetarian dishes would only change the mind of the skeptic or naysayer. Since the merging of both restaurants, Tiffin offers, along with the above dishes, meat dishes to appease the carnivores and their primordial desires (just kidding). 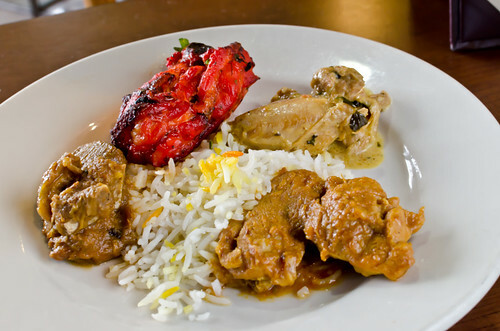 The buffet offerings were Butter Chicken, Goat Curry, Chicken Curry, and Tandoori Chicken. All the dishes were perfectly spiced and cooked properly – the Butter Chicken was moist and a bit rich from the butter sauce, and the Tandoori Chicken was quite smoky from its high searing in the charcoal tandoor. But the radioactive red coloring on it, which seems common in most Indian eateries, was quite scary and in my estimation, and quite unnecessary. Once I could get past this slight eye-sore, I was enjoying the rather moist and tasty bite. The now-defunct Udupi had near its entrance a sweet and candy display counter, which, regrettably, is missing in its new location. However, the buffet line does have a sweet offering at the end. 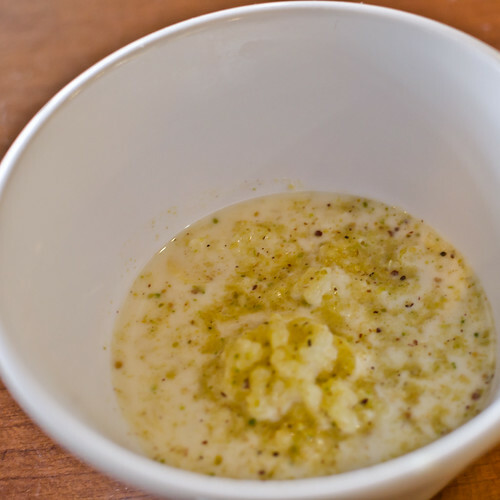 I finished my fiery and spicy meal with something rather mild – Rice Pudding and Almonds. It was only slightly sweet with the rice grains completely cooked and filled with bits of fragrant almond slivers. The use of cardamom and probably rose-water added some interesting fragrant notes to this simple yet tasty dessert. With the abundance of Indian restaurants in the metro area, Tiffin stands out for its dishes that are well-spiced and that do not shy away from flavor. In addition, it is a place where one can indulge in vegetarian and non-vegetarian choices, and the presence of many satisfied Indian or non-Indian customers is a testament to the high quality cooking. Even if you are not vegetarian, you will walk out of there quite sated from the spicy and tasty offerings, whether made with vegetable or meat. 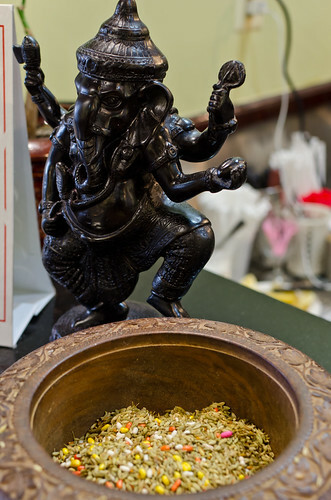 Just make sure to stop by the counter for a breath mint, or a spoonful of anise seeds from a bowl sitting by the Hindu God Ganesh, before heading back to work, unless you run it at your workplace! There is a Tiffin in Chicago’s Delhi section of the city that caters to the North Indian palate. 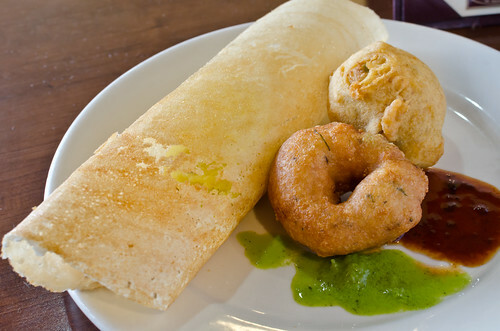 Seeing that you had dosa, the Tiffin in DMV seems to be representative of South Indian cuisine mostly. Will have to try it out to really make comparison. I am looking forward to your assessment! Aha, here is the write-up that I did when I first went with friends a few years ago.